The title of this work is a quotation from the Emperor’s last will and testament, indeed it is one of its most quoted lines: “It is my wish that my ashes may repose on the banks of the Seine, in the midst of the French people, whom I have loved so well”. For this aquatint, Jean-Pierre-Marie Jazet (1788 – 1871) based himself on a painting executed by Horace Vernet (1789-1863) in 1840, the same year the Emperor’s remains were returned to France. 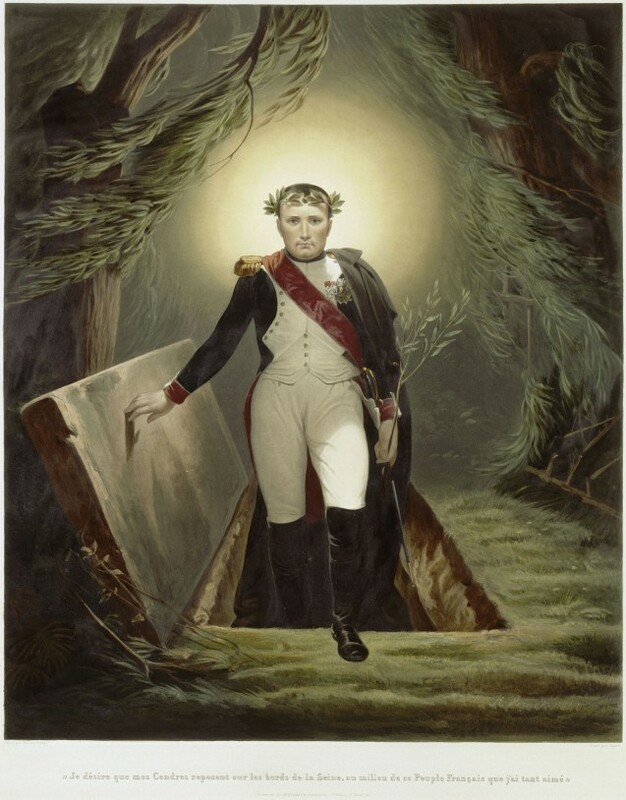 Napoleon, lifting the stone slab of his tomb, emerging from the vault and throwing off his shroud in a halo of ethereal light, is clearly supposed to resemble Christ rising from the tomb. There exist also folk art works derived from this image which reinforce the analogy with Christ’s resurrection by including the figure of a grognard to one side bearing arms, like a Roman soldier guarding Jesus’s tomb. The engraver Jazet bought Vernet’s original painting on 25 May 1840, the day before the French Assembly ratified the royal decision to organize the solemn return of Napoleon’s mortal remains to France. The work later entered the prestigious Demidov collection.